Toddler left scarred for life after being bitten 15 times by other children on a day out at a soft play centre. Willow-Ivy Doherty, 17 months, was playing with her brother Tucker, six and sister Aurora, three, at the Little Beas soft play centre in Seacroft, Leeds on November 2 when disaster struck. The mother was forced to pull a little boy off Willow’s neck when it emerged she had 15 bite marks all over her body, shares Daily Mail. Mother-of-six, Becky, claims her daughter was blue and the youngster who did it ‘had a big smile on his face and blood all around his mouth’, reports The Mirror. Becky said she believed the boy was two and was with a four year old who was apparently his brother. Little Willow-Ivy was taken to hospital where she was given an urgent injection for Hepatitis B and treatment for her cuts. How does this happen? Where was the supervision? This is shocking and so sad and distressing, the behavior of the other child is appaling but both mothers of both children should have been paying closer attention. oh my gosh i felt physically sick in the stomach when i just saw this photo of this poor little one! why are parents not supervising their kids at these places that poor child’s family should sue the pants off the operator for negligence of care! I know i have gone to play cafe’s lots of times and you see families there with heads into screens and not watching their children terrorize other families they are totally oblivious to what is going on. my heart goes out to this little family! 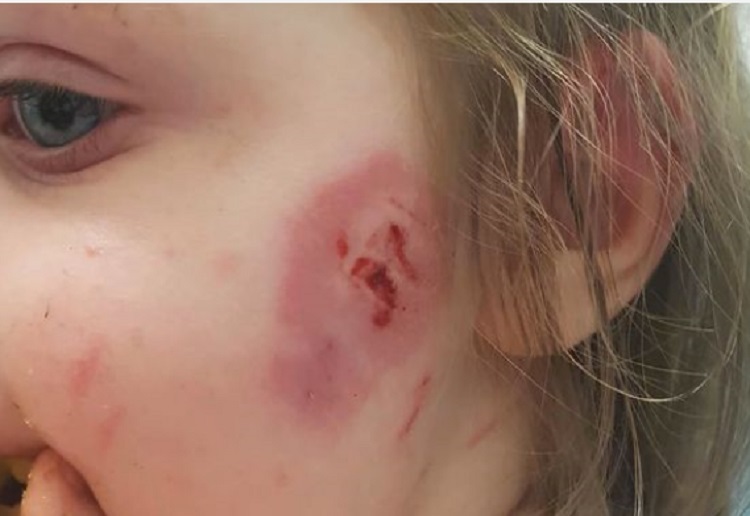 How does this happen that a child has time to bite a child this much without intervention? I’ve known children who bite but they only did it once and were made to apologise and were reprimanded. No matter where you are, your child is your responsibility and if your child bites then it is a reflection on you and not the victim’s or their Mother’s fault. How dare the Mum say that’s what kids do. Wonder how she would have felt if the tables were turned. I understand kids will fight by hitting out or screaming at someone, but never known it to be okay to bite a child so many times. I believe the parents of those 2 should be responsible for the doctors bills and the plastic surgery if any is needed. How often we had taken our kids to play centres only to leave early because other parents view these places as easy child minding options and don’t watch their kids at all. And if you dare to speak up they abuse you! Shocking. poor little mite. OMG. I appreciate parental supervision is important but seriously… do we want to blame the parent of the victim? What about the behaviour of the child who did this? I cannot imagine a situation where a child would even know or understand to do this. Quite frightening really. This is really concerning and I hope that social services can do something to prevent this sort of thing happening again. Oh my goodness, that’s really scary!! That’s disgusting! I am so sick of seeing parents take their kids to play centres and then switch off and let them run riot. You are there with you child, not for a coffee break. I’m not saying to enjoy a coffee but you need to be aware of what you kid is doing at all times. I actually play with my kids at the centre, it’s what makes it more fun. This is horrifying! That poor mum. And the mum who said ‘that’s what kids do’ wholly crap – what the hell is wrong with her? Some people should be allowed to reproduce! These centers really need to be monitored more closely somehow. The amount of incidents my girls have witnessed or been involved in, I will no longer take them to indoor play centers. That’s horrifying. The mother of the one who bit saying that’s what kids do is enabling her young son to be a bully. Poor little one who was bitten. It’s horrible.